Stir up your coffee routine! Our stirring sticks are an elegant and delicious alternative to ordinary table sugar. 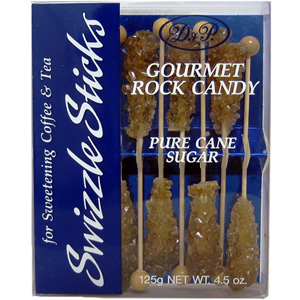 Crystallized pure cane sugar imparts a smooth sweetness to your favorite hot beverage. These eye-catching stirrers bring variety to your coffee experience and ensure a memorable finish to dinner parties. Handmade from the purest cane sugar. Each stick is approximately 10" long (candy + stick).